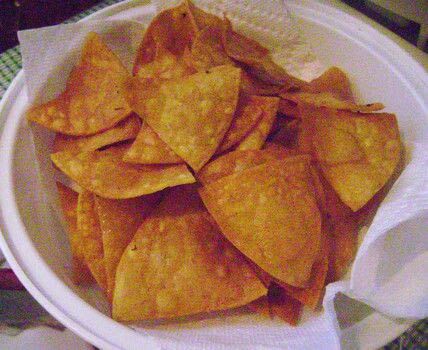 I made these because the store bought chips in the bag can be way too salty or have no flavor at all. They can be baked or fried. Seasonings of your choice (mixed in separate container). (I used garlic powder, cayenne pepper, chicken flavor bouillon) Experiment with different flavors. -Brush tortillas lightly with butter or oil on 1 or both sides. -Lightly sprinkle on your seasoning mix of choice. -Stack tortillas together. -Cut tortillas in desired shape and size. 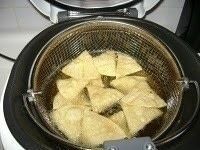 FRYING: -Heat oil in deep fryer or pan (for pan- add enough oil to coat tortilla). 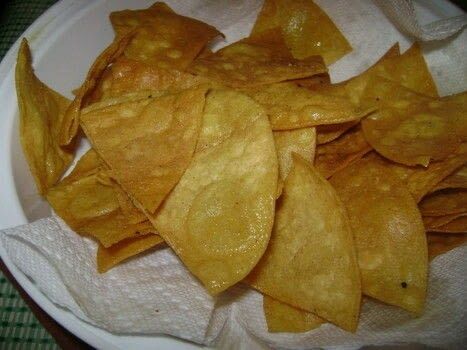 -Place tortillas in fryer and turn when they start to turn brown. -When golden brown, remove and let cool. BAKING: -Place on baking sheet and bake at 350 until brown and crisp.